Objective: Students will decipher and analyze meanings of words to determine which have the most similar meanings. 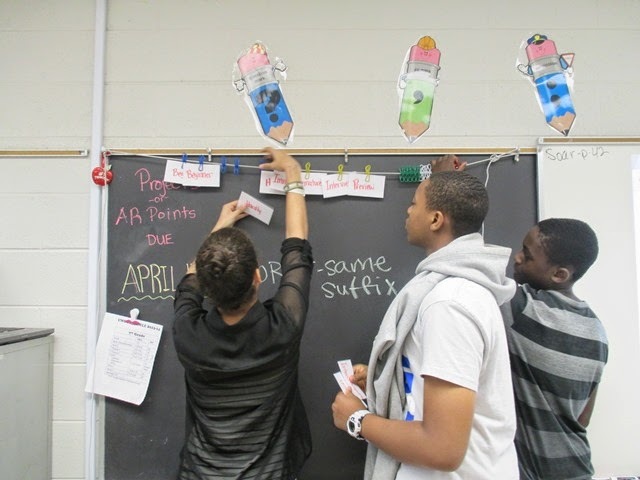 This activity helps students distinguish connotations and make relationships among words. Procedure: At this station there will be either scissors and glue or colored pencils. The teacher can make the directions to cut and paste the words beneath the appropriate word column, or color the synonyms the same color as the heading of each column. Students will match words with the same (or similar) meanings. You may want to give students access to a print or electronic thesaurus or dictionary for this sort. *The "One of These Words is NOT Like the Other Words" presentation on a previous post may accompany this activity as an introduction to word relationships. 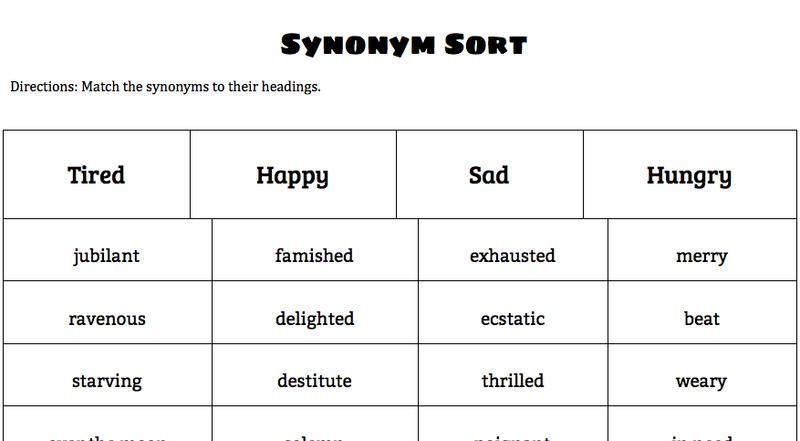 Click to download Synonym Sort. Objective: Students will decipher and analyze meanings of words to determine meanings, then determine which words have opposite meanings. 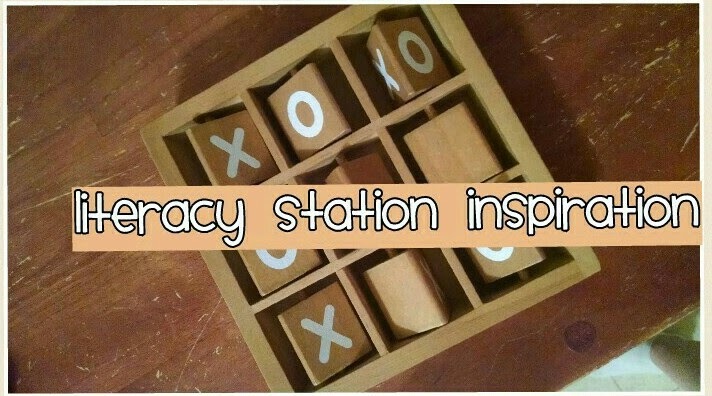 This activity helps students distinguish connotations and make relationships among words. Procedure: At this station there will be either scissors and glue or colored pencils. The teacher can make the directions to cut and paste the words beneath the appropriate word column, or color the antonyms the same color as the heading of each column. Students will match words with the opposite meanings. Click to download Antonym Sort. Objective: Students will decipher and analyze meanings of words to determine which words share common roots and origins. This activity helps students understand word relationships and derivations. Procedure: At this station there will be either scissors and glue or colored pencils. The teacher can make the directions to cut and paste the words beneath the appropriate word column, or color the words with the same root or origin the same color as the heading of each column. Students will first place the Greek or Latin root in the correct column, then find the words that share that root and sort them accordingly. Click to download Word Origin Sort. Objective: Students work together to revise these boring sentences and apply vivid vocabulary. Procedure: Students are given either the handout or sentence strips. They must cooperatively change any pronouns to specific nouns, incorporate words with specific connotations, and add adjectives and adverbs to make more complex, descriptive sentences. 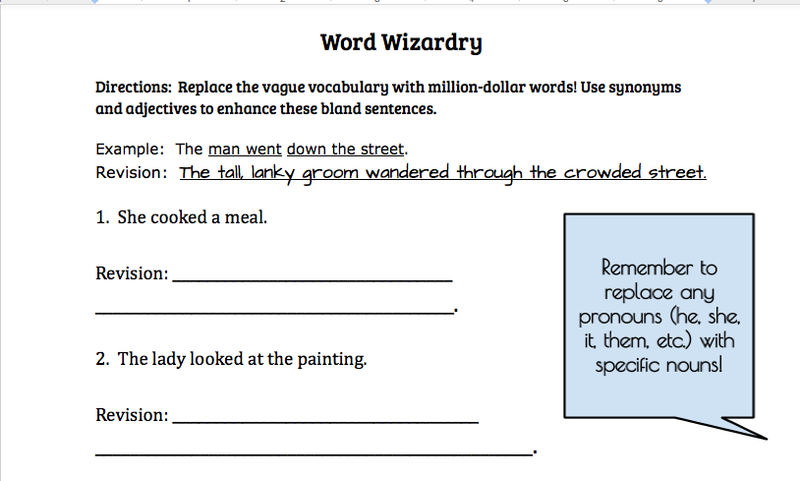 Click to download Word Wizardry handout. Procedure: There will be 24 word parts written on index cards. There will be a sheet that accompanies the instructions that contains the meanings of each word part. As a group, students will make as many words as they can using their prior knowledge and the definitions of each morpheme. In the envelope will be a handout asking for words they made and the meaning of each word made. Objective: Students will apply knowledge of word parts to link words based on meaning and relationship. Procedure: At this station we have 20 words written on index cards. There is also a handout that has the graphic organizer (printable below). The first word and last words are given on the handout. Students will write in each word (from the index card) in the order that they fit so that a prefix, root, or suffix is shared with each preceding and subsequent card, until they reach the last word. Students manipulate this station using index cards on a clothesline! Objective: Students will apply knowledge of roots and affixes to expand vocabulary. Procedure: This station will require the attached handout and a dictionary or thesaurus. Students will be given a selection of root word parts, then use the reference books to find words with common roots. Each student will choose a different root word part. They will add prefixes and suffixes to "grow" their roots into other words. They must also write the meaning of each word. Objective: Students will determine feelings and connotations associated with words (out of context). Procedure: This station can include handouts on which students write or index cards that are manipulatives. Students will be given twenty sets of words containing three words each. They must sort the words into positive, negative, and denotation. You may want to keep a dictionary or two at this station so that students are able to look up unfamiliar words. Objective: Students use context clues to make up their own meanings of nonsense words. Procedure: At this station there will be stories with nonsense words, (such as Dr. Seuss stories). Selected words will be highlighted in the text. 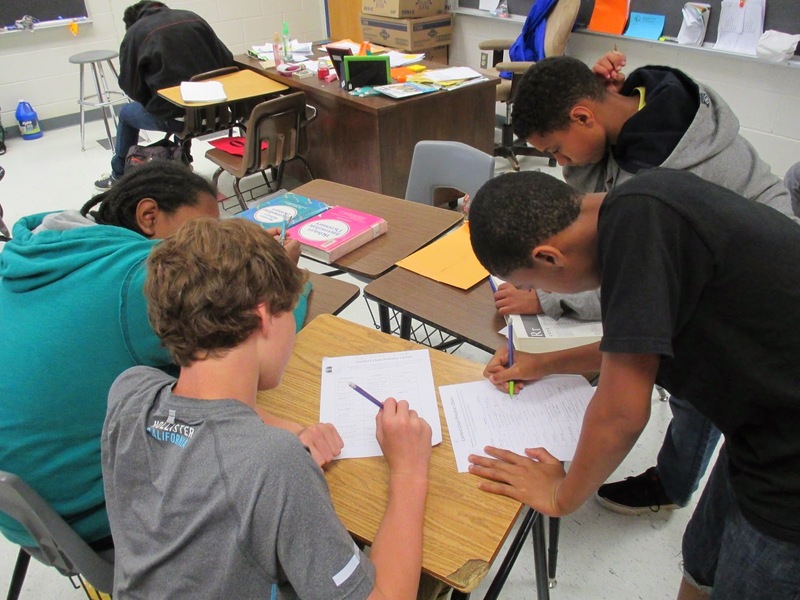 Students will work cooperatively and use context clues to determine what they believe the word most closely means. On a sheet printed with each word (in the style of a dictionary page), students will write the part of speech, an official definition, and their own sample sentence. The connotation sort links are the same document. Could this be corrected? Thanks! Where are the morpheme matchup cards, please?